“The unjust will be caught in their own snares,” says King Solomon in Proverbs 11:6. And the wise King’s famous comment on the wisdom of right living still holds true, as yet another bank fraud settlement finds US megalender Bank of America caught in another multimillion dollar snare of its own making. The newly-settled case, pressed by the US Department of Justice in connection with bad loans sold by BofA’s now-defunct Countrywide division, was pressed not only against the bank as a corporate entity, but also against an individual, Countrywide executive Rebecca Mairone. This suit, one of many against the bank, charged that BofA and Countrywide, represented by Mairone, defrauded the government-backed lenders Fannie Mae and Freddie Mac by selling them defective loans bought from Countrywide. The case hinged on a practice called the “High Speed Swim Lane”, “HSSL” or more accurately, “the Hustle” – a lending process used at Countrywide, which was bought by Bank of America in 2008, when the real estate bubble was about to burst. The Hustle rewarded loan officers for producing loans – lots of loans, never mind the quality. The end result: massive amounts of poorly executed loans granted to unqualified buyers, which presumably padded quotas for high-achieving loan officers, but which were then passed on to Fannie and Freddie once Bank of America acquired Countrywide. The Justice Department is asking that Bank of America pay $863.5 million in damages over the case. And that, added to litigation costs loan adjustments and previous judgments in the apparently endless string of suits, makes the cost of the bank’s acquisition of Countrywide far higher than the $2.5 billion it paid for the company. The latest judgment joins a long list of others including the “robosigning” scandal and other mortgage and securities fraud as well as the misreporting of interest rates to LIBOR, the international rate standard. Although settlement checks were sent directly to victims of robosigning fraud, most of these penalties won’t actually reach loan customers directly. Even so, these cases have a direct effect on mortgage applicants and other consumers of bank services, The scandals and criminal activities of the Bank of America and its cohorts, including JP Morgan Chase and Citigroup, have been responsible for the enactment of various legislation aimed at protecting consumers from thee fraudulent practices. An outcome of those laws, including the Dodd-Frank Act and the Financial Institutions Reform, Recovery and Enforcement Act, has been tighter loan standards that make it tougher form marginal borrowers to get financing. And of course, the costs of doing Bank of America’s business in these cases will likely be passed on to its customers in the form of higher fees and interest rates. 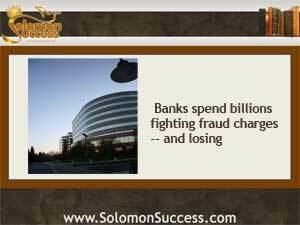 More Fraud Charges Coming for Chase Bank?